Digweeds is an area of open space maintained by the Parish Council. It lies close to the site of the original Ecchinswell church and is named one of its churchwardens, John Digweed of Ecchinswell House, who was the only person to be interred in the church in 1844. A plaque referring to him is still in evidence. The Parish Council are developing this site to enhance its attractiveness as an amenity for the parish and a large amount of tree clearing and maintenance work has already been carried out. Sadly, a lovely feature birch tree was lost when it blew down during a gale but in 2008 five new trees - two different types of alder, a rowan, hawthorn and crab apple - were planted, along with 5 cornus bushes. Digweeds is on the village maintenance schedule and will be mown on a regular basis during the summer months to keep undergrowth under control, although it is intended to maintain a patch of nettles to attract butterflies (though this has yet to be realised because as they grow, kind-hearted people cut them down thinking that they are helping!). 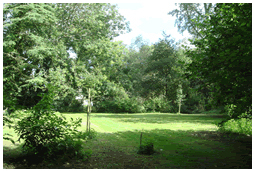 The Parish Council applied for a grant under Hampshire County Council’s “Small Grants Scheme” for a bench and a map board to be sited at Digweeds, to enhance public enjoyment of this open space. The Parish Council were delighted that this application was successful and Hampshire County Council provided half the funding for this project; the remainder of the funding came from the “S106” money that the parish received following the development at Palmers Yard. 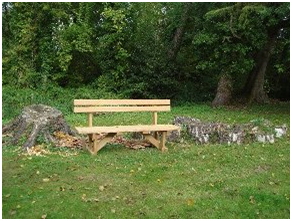 A wonderful bench, made by a local craftsman, was installed and a photo can be seen here. Production of the map board, showing local Rights of Way, points of interest etc, is well advanced, so watch out for a notice on this website shortly that the board is in place. There is already a lot of wildlife to be spotted, such as a kingfisher nesting nearby and various rare visiting birds, and a white admiral butterfly has been seen in recent years along with slow worms. It has even been reported that an adder was seen basking in the sunshine; the adder is the UK's only native venomous snake, though they are placid and retiring creatures and usually only strike during attempts to catch or handle them, so you are advised to admire them from afar! Plant trees to attract birds and insects – rowan (mountain ash), wild cherry, crab apple, alder. Plant two small yew trees on the lake side of Digweeds to provide cover for the birds and to provide a screen for Lake House. Plant a hawthorn and blackthorn screen at the bottom of the Old Vicarage garden to provide cover for wildlife and to encourage early butterflies. Plant buddleia to encourage butterflies. When the grass is in better condition, to set aside an area of grass for planting as a wildlife meadow. To make a feature of Digweed’s grave by surrounding it with a small area of gravel and very low wooden fencing. 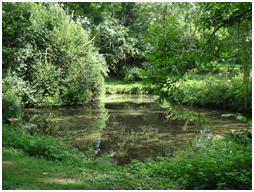 To leave the area behind Digweed’s grave, overlooking the brook, open for the view. To allow a patch of the dogwood (cornus) to re-grow near the bridge. To allow a patch of brambles to re-grow to encourage and support wildlife. To leave an open area of mown grass for those who walk and want to sit in Digweeds. To find out if the school would like to plant and look after a living willow structure, such as an arch. This area is an amenity for YOUR enjoyment and the parish council would encourage you to comment on how it should be developed. Please contact the Clerk with your comments, or if you would like to help with the maintenance and care of Digweeds.